When the customer gets a printed token, the token number will pops in the list of queued customer at the desktop of that particular customer service officer (CSO). When CSO will start serving, the top most token number form the list will be displayed in the LED board above CSO so that customer can approach the counter. Once the customer’s query is served, CSO will mark the token as served, automatically the next token will be displayed in the LED and this will continue till the customers are waiting. 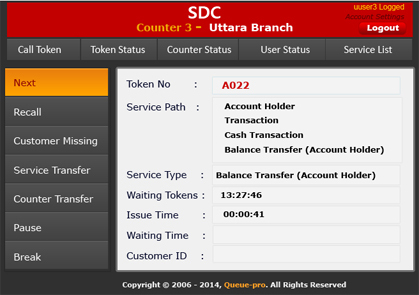 Service Officers (CSO) are able to view all relevant information of the customer arriving at his counter like token no., customer type, transactions requested, wait time etc. Facility to redirect / reassign between service to service, counter to counter. CSOs are able to stop or pause operations for his counter for a certain period of time.